Bravo Stripper™ 120 volt, 2000 watt, 17 amps, 145 lbs. 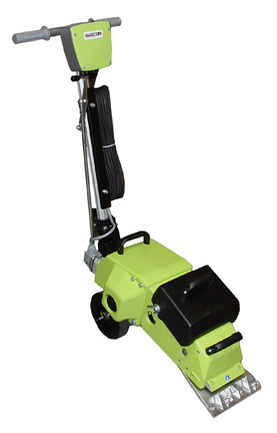 Our mid-range self propelled, variable speed floor removal machine is ideal for residential or commercial take up of vinyl, carpet, VAT or VCT. Features: 8,500 Oscillating strokes per minute, variable speed control, blade angle adjustment, adjustable handle angle, top handle adjusts from side to side for wall clearance, dual dedicated motors (one for the drive system and one for blade cutting action), hand operated clutch for the drive system, power overload protection, additional weight for tougher take ups, utilizes our 8" self dicing blade (no pre cutting of flooring necessary) or Razor Attachment for adhesive residue removal.